I’ve never met a mono-color outfit I didn’t like. Granted, I haven’t been brave enough to try the white on white outfit and really the only other ones I’ve tried have been all navy or all black. This casual Friday all navy outfit with accents in leopard print shoes and the striped pleats didn’t disappoint either. All navy ftw! I picked up this adorable french terry top during the big Nordstrom Anniversary sale in August and lo, it’s been too flipping warm to wear it. But it is quite perfectly, a fantastic casual Friday outfit or good for kicking around on the weekends when you want to look…slightly more put together than just leggings (as most of my weekends are spent). The top itself, I was worried about because the cut to the pleats is a little funky and I think it’s probably not the MOST flattering of tops but man, is it comfy as all heck. 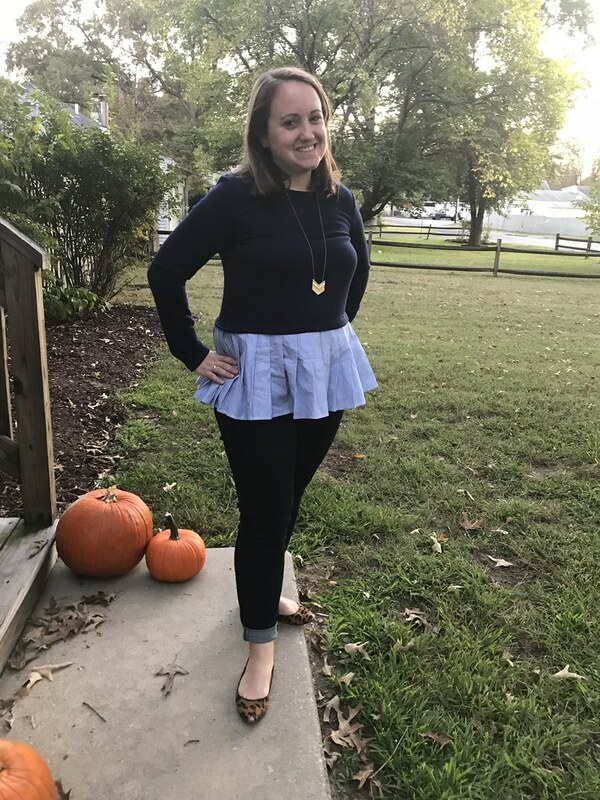 The pleats are kind of a pain – unlike most of my other peplum/pleated tops that are more of a crepe type material, these are more of a stiff cotton so they get wrinkled super easily and don’t like to lay flat and look pretty like they should. Silly pleats.